I recently had the pleasure of visiting The Bowes Museum in Barnard Castle, specifically to see a temporary exhibition ‘Tim Walker: Dreamscapes’, a collection of images by the legendary photographer. The museum has a fascinating history as it’s never been a home – it was purpose built by John and Josephine Bowes in the 19th Century as a museum with the aim of introducing the arts to the people of the North East. The building is based on a French chateau and is an utterly magnificent creation, which sadly neither Josephine or John lived long enough to see finished. My initial impression, on arriving at the room hosting the exhibition was one of understatement, as the room was darkened, with the images shown in front of light boxes. From the outside, it’s not terribly impressive. However, once we went inside and really looked at the photographs, that impression was completely reversed and I was transfixed by the photographs on display. Walker is best known for his flamboyant fashion and lifestyle photography, which has long graced the pages of the most famous glossy magazines. The collection of photographs on display included works featuring well known models, such as Lily Cole, Stella Tennant and Kristen McMenamy. However, even they, in their beauty, are somehow secondary to the incredible sets, props and landscapes used in each image. The surrealist and eccentric feel to the photos reminded me of Alice in Wonderland on more than one occasion and the colours and detail in each one is just stunning. What’s remarkable about the photographs is that Tim Walker doesn’t use digital media to manipulate what you see. So, if the photograph features a bed in a tree, then there really was a bed in a tree. Likewise, a bathroom transported to a woodland stream, balloons billowing from the windows of a country house, eighty cakes in a bedroom or (in a collaboration with Tim Burton) a giant, crying skeleton. Many of the images were taken at close-by Eglingham Hall, in Nortumberland, so it seems quite fitting that they’re on display here. We didn’t get much chance to look around the rest of the Bowes Museum, as we decided that tea and cake in the Bowes cafe on site was more urgent (sorry! ), but it feels safe to say that admirers of silver, porcelain and textiles would find much to please them in the permanent and internationally-renowned collection. 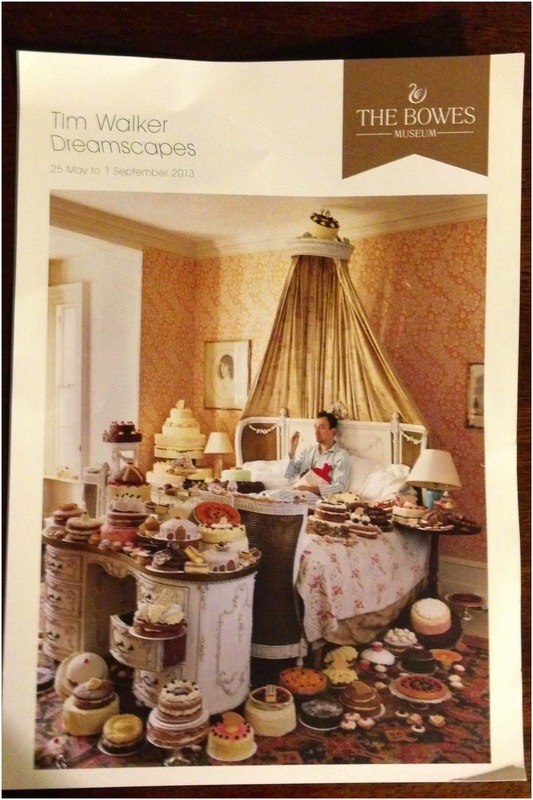 Tim Walker: Dreamscapes is exhibiting until 1st September.